Much like learning to drive a car, learning to swim, and learning how to read – cooking is a life skill. Did you know that it is never too early to learn valuable lessons in the kitchen? In fact, infants absorb everything that is going on around them. They learn when you name foods aloud, and the whir of a blender can stimulate a baby’s learning ability. A toddler learns by pouring and mixing, pre-school children learn fine motor skills by cracking eggs, grade-school children learn by chopping (supervised) and whisking ingredients, pre-teens can begin to follow simple recipes independently, and finally teens, who naturally seek to be more independent, can aspire to more complex tasks like preparing a meal for the entire family. Until a child is old enough, an adult should always be present, to supervise in the kitchen. Hands should always be washed thoroughly before food preparation begins. Turn pot handles toward the back of the stove to prevent unwanted accidents. Do not “sample” raw meat or uncooked eggs. Allow your child to practice cutting with a butter knife. Cooking is a basic life skill that everyone should learn. There are many excellent reasons for children to be encouraged to cook, one being that it gives them a sense of pride. Below are several more reasons to get children of all ages involved in kitchen activities. Children, who are involved in the cooking process, may not be finicky about their food choices. Being involved gives children an opportunity to view all ingredients and taste different foods. It has been proven, that children are more inclined to eat what they prepare. They may even find a new favorite food. When children are invited into the kitchen, a dialog of good eating habits is opened, such as how eating a rainbow of colors offers a wide variety of vitamins and minerals to stay healthy. In addition to discussing healthy eating habits, time together in the kitchen allows the opportunity for talking about other things, such as problems in school. The value of planning is a benefit that is learned in the kitchen. Cooking involves timing and planning. For example, the potatoes should still be hot, when the meat is ready to be put on the table. Also, you want to have all of the ingredients necessary on hand, to prepare a certain type of meal. Time management is a skill that is used in all aspects of life. Math skills are also built while working in the kitchen, as measuring ingredients is a practical way to show the use of fractions in everyday living. For example, addition and/ or multiplication is going to be required if you want to double a batch of cookies. In addition to honing math skills, cooking is basically a giant science experiment. Children get a chance to view chemistry in action, by finding out what happens when vinegar is mixed with oil, or the results when too much salt or flour is added to a recipe. Children should feel good about creating something delicious and nutritious, and parents should feel good knowing that when children leave home, that they will not be dependent on frozen meals or vending machines for sustenance. Besides all the great lessons that are learned while cooking, preparing a meal is also fun! Spending time together in the kitchen with your children, not only produces good meals, but also builds positive memories. Click Here to login to your patient account. Providing a wide array of children's dental procedures including Fillings, Crowns, Sealants, Fluoride treatments, Oral Hygiene Education, Dietary Counseling, Anticipatory Guidance, Happy Visits, and Orthodontic Space Maintenance. Sedation and antesthesia services are available. 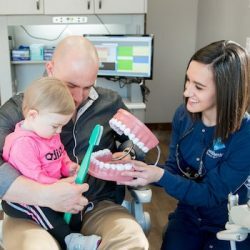 Let us be your child's Dental Home. 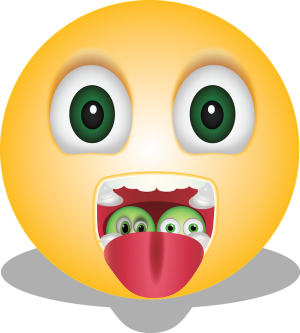 Mommy – My throat hurts! Baby, baby, please brush your teeth….